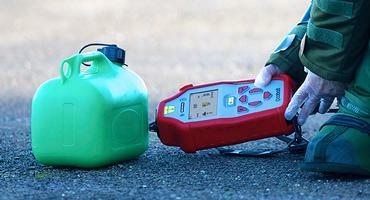 Cobalt’s Resolve new handheld system that identifies hazardous materials through sealed opaque containers, including explosives and CWAs, will be demonstrated at DSEI, London. This will be Cobalt’s first time at both these major international defence and security events, and there will be hands-on Resolve demonstrations. Resolve was launched in 2016 for applications in hazmat incident management, military search and EOD, first response, law enforcement, and screening at ports & borders. The system uses Cobalt’s proprietary spatially offset Raman spectroscopy (SORS) technology to detect and identify chemicals through opaque barriers such as thick coloured plastics, dark glass, paper, card, sacks and fabric. Measured spectra are accurately matched to comprehensive on-board spectral libraries and the system identifies materials including; explosives and precursors, hazardous and toxic materials, CWAs, narcotics and new psychoactive substances, plus thousands of benign chemicals. Resolve is already deployed worldwide in military applications as well as in hazmat response, policing and customs screening.